It would be easy to assume that the greater the proportion of riders that like a new bike the happier the designer would be. That's not the case for Gérard Vroomen and his radical new 3T Strada. The Strada in the Italian countryside. 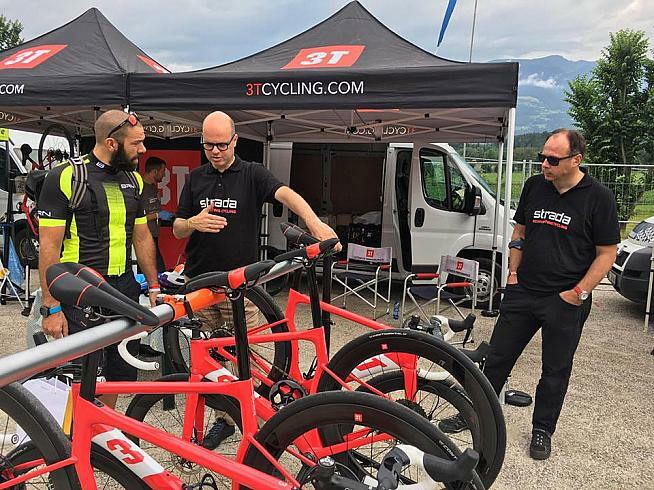 that Vroomen co-founded Cervelo and Open, is co-owner of 3T, has three Eurobike gold medals to his name and is described as a "visionary" on a regular basis it may be worth giving him the benefit of the doubt. "Consumer reaction has been about 50-50. That's good," he told Granfondo.com. "If you get over 50% it's a problem because it looks old in six to nine months," he said drawing on his experience of radical launches at Cervelo. It's fair to say that there is little chance of the Strada appearing ordinary in six months' time. 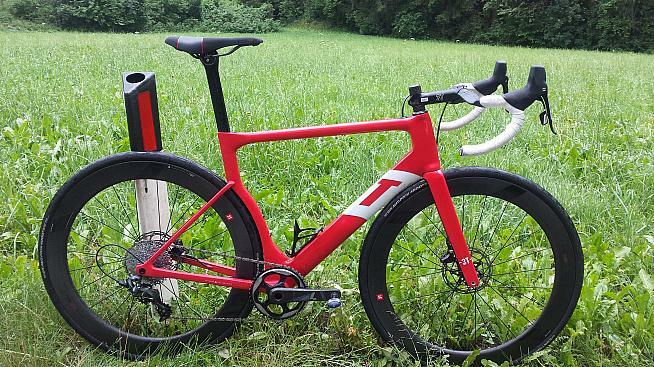 The design brief was to come up with the road bike of five years from now, today, and 3T declare that they have "reinvent(ed) the aero road bike from scratch with the STRADA". Only time will tell whether large numbers of us will be riding something similar to the Strada in 2022. Aspects of the Strada's design are, however, thought provoking. Aero frame, big tires, disc brakes and no front derailleur - it certainly looks radically different from the stock of your LBS with their incremental changes year to year. Vroomen is confident he knows exactly who will buy the Strada. "Early adopters, that 10%" was his instant reply, speaking at Eurobike's Media Days test event at Am Kronplatz in the Sud-Tirol region of Italy. "People want to go fast. Everyone wants to go faster, whether it's Chris Froome or a rider like me who is not fast." The 1x11 set up and the tight clearance on the tires. On an hour-long test ride the Strada revealed itself to be comfortable for an aero bike and certainly seemed slippery and fast. The 1x11 gearing gave more than enough range to tackle the climbs on our loop with the equivalent of a 34x28 available and the only issue with the SRAM set up was the lack of anything to do with my left hand in the absence of rings at the front to change between. The Strada seemed to sail on without losing speed when I stopped pedaling. Given the proportion of drag generated by the rider (especially one of my "ahem" build) this is probably my imagination, but, hey, it looks fast and feels fast. On the slippery side of the equation 3T say that starting from scratch on the design allowed them to avoid certain compromises. They claim that the "Arcfoil" shaping of the frame ("a lightbulb moment") is a significant advance from traditional designs and that the use of a 1x11 set up addresses a major source of drag. 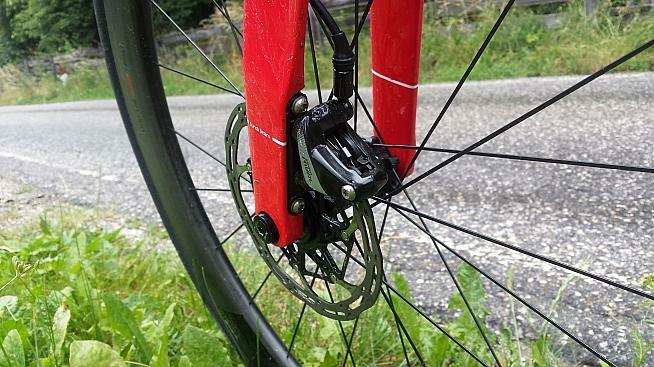 "The worst area aerodynamically is around the BB, with the frame, crank, chainrings, front derailleur, water bottles and rider's legs leaving little room for the air to pass through. 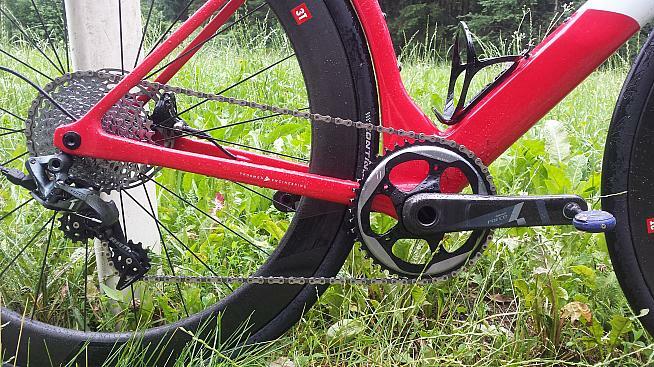 A single ring drivetrain eliminates the front derailleur and one chainring, reducing frontal area, creating space for unobstructed airflow and freeing up the design of the seattube to shield the rear wheel even better (no front derailleur mount needed)." While thin seatstays help, the bike's comfort comes mainly from the larger tires. Traditionally, wider tires have tested badly in the wind tunnel because aero frames have not been designed for them. The Strada was optimized for 28mm rubber and that means the comfort gains have not come at the expense of speed. 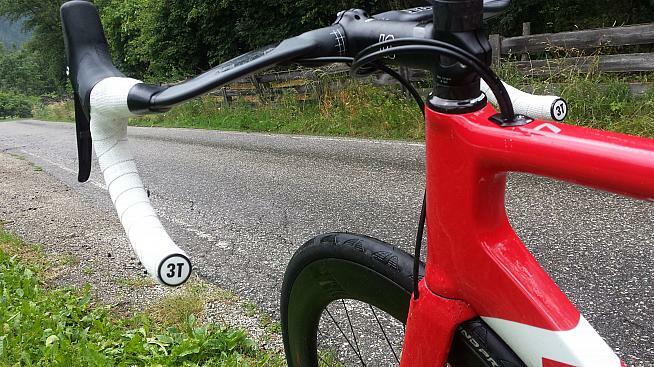 That optimization has produced very tight tolerances between tires and frame with aero benefits. Vrooman teamed up with René Wiertz CEO of 3T in early 2015, describing it as "a dream come true". "There are four historic cycling-related brands I absolutely love, and 3T is one of them." 3TTT — Tecnologia del Tubo Torino - was founded in 1961 by Mario Dedioniggi and has a longstanding reputation as an innovator in cycling components, forging its name with the use of aluminum, particularly for bars. Vroomen founded Cervélo with Phil White in 1995 and left in 2011 though he continued as an advisor. In the meantime before joining 3T, Vroomen had founded Open, which makes mountain bikes and gravel bikes. 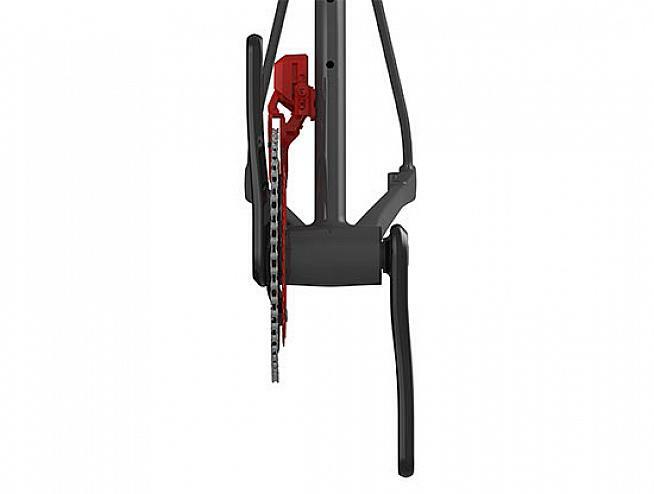 The disc only frame hides away the calipers to cut drag. It will be fascinating to see how common it becomes to see Stradas in the wild and how many of its features are adopted more widely. In the meantime it has certainly garnered headlines for 3T as a maker of frames, which can only be helpful if the firm's plans are to push further in that direction. The Strada is sold as a frameset comprising: Frame, fork, headset, seatpost, seatpost internal clamp, front and rear 12mm thru axle, 2 rear derailleur hangers, noise-cancelling foam sleeve for rear derailleur housing and brake hose. Frame weight is 970g +/- 3% (M size).